The most dramatic updates include a higher-res display and a much bigger battery. Update: You can read our full review here. In anticipation of our coming review, we decided to haul HP’s refreshed 15-inch Spectre x360 2-in-1 out of its box and compare its against last year’s model. Some updates you can’t see, of course. All configurations now feature a Core i7 dual-core processor, discrete GPU (Nvidia’s GTX 940MX), and a 79.2-watt-hour battery. The latter is a nice upgrade from the previous generation's 63WHr version. All models get a 4K UHD screen. What you can see are a smaller footprint and narrower bezel, and a slight increase in thickness. The 2017 Spectre x360 15 also has lost two USB 3.0 Type-A ports and a mini-DisplayPort in favor of a single USB-C 5Gbps port. It’s gained 4 ounces, though, for a total weight of 4.43 pounds. As you might suspect, these updates raise the price of the base model, which still features 256GB of storage and 8GB of RAM. Previously, this line started at $1,150 for a full HD screen and Core i5 CPU with integrated graphics, but with the 4K screen and discrete graphics it now begins at $1,280. 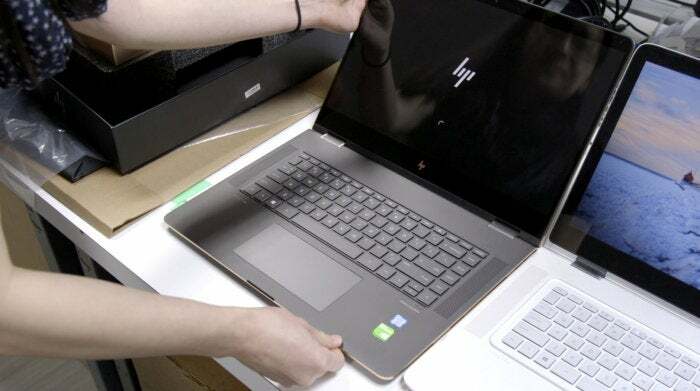 That said, rival laptops with quad-core parts and a touchscreen (like the Dell XPS 15) start at $1,600—so HP may keep its lock on consumers who want a premium, portable 15.6-inch laptop with good battery life at a reasonable price. We’ll find out how this new hardware holds up soon enough.